The NCAA Division I Men’s Hockey Championships begins Friday as 16 teams compete to finish their seasons in Buffalo as the national champions. The Frozen Four will be held at KeyBank Center on April 11 and 13. 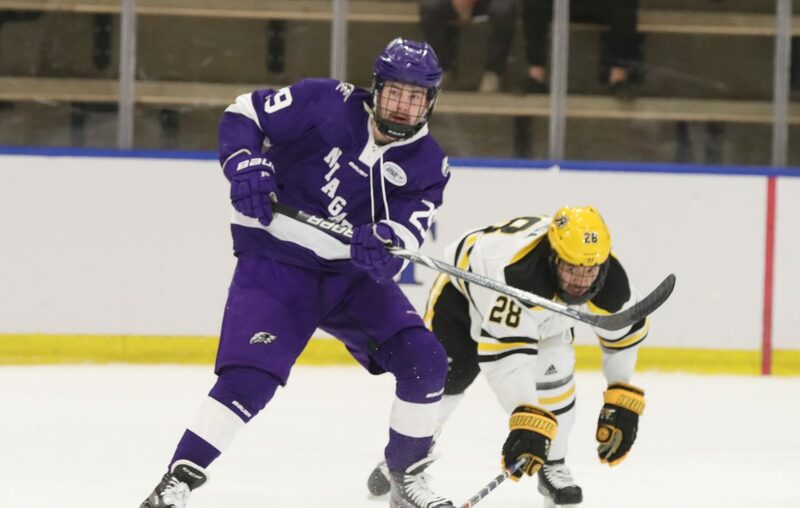 American International College, which defeated Niagara, 3-2, in overtime Saturday at Harborcenter for the Atlantic Hockey Association championship, drew a tough assignment in the first round. The Yellowjackets (22-16-1) will face St. Cloud State (30-5-3), the No. 1-ranked team in the nation, on Friday at Scheel Arena in Fargo, N.D., in the West Region. AIC, the region’s fourth seed, was one of six teams to earn an automatic bid for winning its conference tournament. It will be the first time AIC will play in the NCAA Tournament in 70 seasons of hockey at the Springfield, Mass., school. AIC first put a team on the ice in 1948-49 and started playing Division I in 1998-99. The other game in the West pits Denver (22-11-5) against Ohio State (20-10-5). St. Cloud, the No. 1 seed in the West, is an at-large entry, after losing to Minnesota-Duluth, 3-2, in overtime in the National Collegiate Hockey League championship game on Saturday. Other automatic bids went to defending national champion Notre Dame (Big Ten), Clarkson (ECAC), Minnesota State (Western Collegiate Hockey Association) and Northeastern (Hockey East). All six conference championship games Saturday were by 3-2 scores, and four went to overtime. Three losing teams in conference championship games were selected as at-large entries. They are St. Cloud, Cornell and and Bowling Green. Niagara was one of three conference runners-up not selected. The others were Penn State and Boston College. Massachusetts (28-9), an at-large team, will be the No. 1 seed in the Northeast Regional at SNHU Arena in Manchester, N.H. The Minutemen will face No. 4 Harvard (19-10-3). No. 2 Clarkson (26-10-2) will face No. 3 Notre Dame (22-13-3) in the other Northeast game. Minnesota State-Mankato (32-7-2) will be the No. 1 seed in the East Regional at Dunkin Donuts Center in Providence, R.I., and face the hometown Friars (22-11-6). No. 2 Northeastern (27-10-1) will oppose ECAC runner-up Cornell (20-10-4) in the other game. Minnesota-Duluth (25-11-2) will be the No. 1 seed in the Midwest Regional at PPL Center in Allentown, Pa., and face No. 4 Bowling Green (25-10-5). The other Midwest game will have No. 2 Quinnipiac (25-9-2) taking on No. 3 Arizona State (21-12-1), an independent playing in the national tournament for the first time. West Regional and Northeast Regional games will be Friday and Saturday. The East and Midwest regional games will be Saturday and Sunday. All regional and Frozen Four games will be televised by ESPN. The four regional winners will make up the Frozen Four for the national semifinals and championship game. Friday, March 29, 7:30 p.m.
Friday, March 29, 4 p.m.
Saturday, March 30, 9 p.m.
Friday, March 29, 3 p.m.
Friday, March 29, 6:30 p.m.
Saturday, March 30, 6:30 p.m.
Dunkin’ Donuts Center, Providence, R.I.
Saturday, March 30, 1 p.m.
Saturday, March 30, 4:30 p.m.
Sunday, March 31, 4 p.m.
Saturday, March 30, 4 p.m.
Sunday, March 31, 6:30 p.m.
Thursday, April 11, 5 and 8:30 p.m.